Find a perfect escape in the middle of Danang city? Find your way to NEW ORIENT HOTEL DANANG. The hotel provides modern design combined with green space and airy balcony brings you the most pleasant relaxation. Moreover, with 2 world-class restaurants and 1 roof top bar, it’s our promise to keep you entertained all day. Start off by a healthy and dedicate breakfast at Bistecca – Italian restaurant offering the original home-made taste with a large selection of Italian and international wines, ensuring the right combination of flavors from plate to your glass. Then, wondering around Danang city before heading to Thien Long Hien – HongKong restaurant, where the traditional concept of a Cantonese kitchen is brought to a new level of sophistication with a contemporary Oriental ambience. 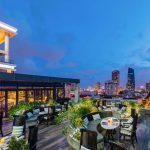 Ending your great day by visiting Sevva Sky Lounge – Situated on the roof top of New Orient Hotel, Sevva Sky Lounge offers not only stylish cocktails and delicious canapé, but also offer breath-taking 360 degree view of Da Nang city, cool music and state-of-art sound and light system.